Chinese farmers have taken over formerly white-owned farms for the first time, investing millions of pounds into tobacco production. Farms that were badly managed for nearly 20 years, after Robert Mugabe’s mass seizure of white-owned land, are now being worked again in the hope of reaping a potentially huge reward. At least five farms have attracted Chinese investment in Mashonaland Central, a region to the north-west of Harare, that was traditionally one of the country’s best tobacco-producing areas. Safe in the knowledge that Mr Mugabe’s policy of strengthening ties with China will offer a degree of protection, they have poured money into machinery and are taking advice from international experts. China has become the largest investor in Zimbabwe, the economy of which is still reeling from the land seizures of 2000 and hyperinflation, has taken a nosedive once again. Unemployment is running at about 90 per cent and the regime is so short of money that it cannot pay teachers or civil servants. The dire economic conditions have prompted rare protests against Mr Mugabe’s regime by a coalition of opposition parties. Yesterday, a heavy police presence in Zimbabwe’s capital Harare stopped a planned mass demonstration, as activists claimed police used live ammunition to disperse small protests. While Zimbabwe’s land reform process has empowered around 60,000 small-scale black tobacco farmers, who grow lower grades of tobacco, many of the bigger farms distributed among Mr Mugabe’s cronies have not fared so well. Farms just north of Harare lie fallow amid broken fences, fields scorched by fires and scarce livestock. There are few surviving indigenous trees as many were felled by new farmers who could not afford coal to cure their tobacco. A generation of evicted white farmers have moved abroad or live hand-to-mouth, waiting for promised compensation. 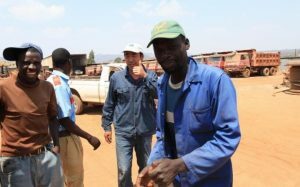 One farm worker in Mvurwi, about 60 miles north of Harare, said there were now plenty of jobs in the district after years of difficulties following the departure of the white landowners. “The Chinese are spending money,” he said. Experts believe that the five Chinese-run farms will, despite their limited experience, grow and cure about 1,500 acres of tobacco this year. They said the new infrastructure including equipment manufactured by US company, Valley Irrigation, must have cost at least £7 million. An insider in the tobacco industry said the Chinese company would be paying a hefty rental for the land they are now using to the “political” men who now own the farms.